Our pets can leave us frustrated when they begin to use our carpets as their bathroom. Urine is extremely difficult to rid of once it has had the opportunity to sink into the carpets fibers. If urine is not treated, it can continue letting off a terrible odor for up to three years. Nobody wants their home to smell of pet urine for that long. I am going to be sharing with you, the best carpet cleaning for pet urine! Once urine has been deposited onto the carpet, it takes a ton of work to remove it. Any household cleaning solution may only remove a small bit of the urine. The odor can permeate throughout the entire home making it difficult to feel at ease. If your carpets have fallen victim to your pets, do not fret jut yet! 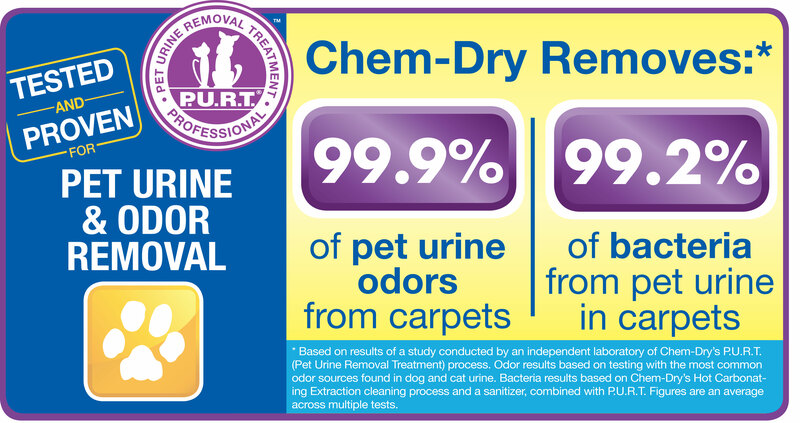 Sunrise Chem-Dry has a special pet urine removal treatment that can save your carpets! 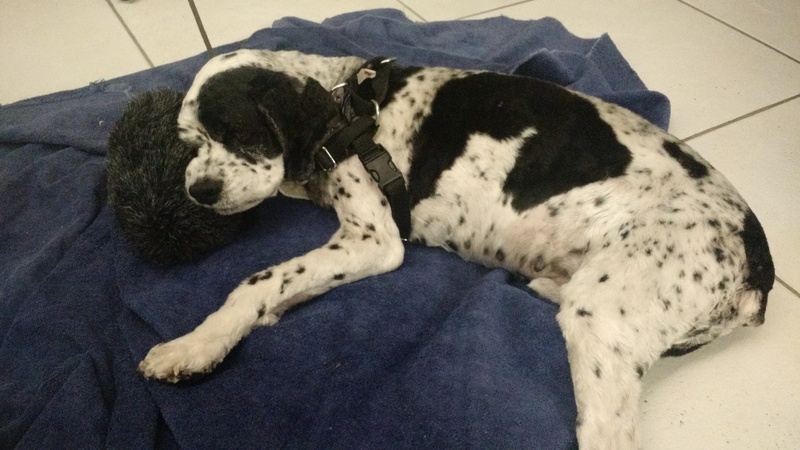 This company has proved to be the best carpet cleaning for pet urine, time and time again. I have a senior dog who does not always make it outside to use the bathroom. My bedroom carpet has become victim to his accidents and it was very apparent. I was embarrassed to have anybody in my bedroom due to the strong urine odor. 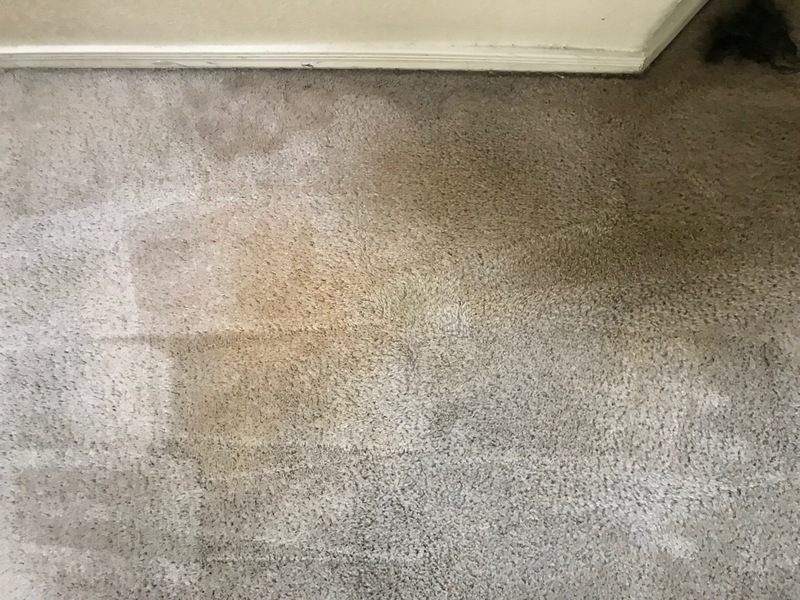 If your carpets have a similar story, this company will provide the best carpet cleaning for pet urine in your home as well. Sunrise Chem-Dry uses a pet enzyme treatment referred to as P.U.R.T. (pet urine removal treatment). Technicians begin by locating the urine spots on your carpet using a special light. Once the spots are located, P.U.R.T. is deposited onto them. Urine tends to spread within the carpet. The visible spot is not nearly as large as the urine deep within the fibers. Sunrise Chem-Dry technicians ensure that every centimeter of the urine is covered in the solution. Once the P.U.R.T. has been poured onto the effected areas, it is given a few minutes to begin breaking down the urine. This solution has the ability to completely break down the enzymes and dissolve them entirely. Over the next 24 hours, the P.U.R.T. will continue to break down the urine until there is nothing left. Both the urine stain and odor will be completely gone! It is highly recommended to get a general cleaning done when you receive the pet urine removal treatment done as well. During the general cleaning, excess urine will be removed from your carpets to ensure that the P.U.R.T. has the ability to concentrate on the set in urine. Not only will this remove a lot of urine from your carpets, but your carpets will also look and feel amazing after! Sunrise Chem-Dry is the best carpet cleaning for pet urine as well as in general! This company only uses 100% green certified cleaning solutions that are safe for your children and pets! A pre-treatment is included in every cleaning to ensure that spots, stains, and traffic areas are removed entirely. The pre-treatment will also be capable of helping rid of the urine stains even more. After the P.U.R.T. and general cleaning has been completed, it is time for the extraction. During the extraction, excess water is removed from your carpets as well as dirt, dust, debris, and allergens! 98% of all allergens are removed from your carpets during the general cleaning and 89% of all airborne bacteria is removed! This means that your carpets will look and feel cleaner and healthier and the quality of air will improve immensely as well! Urine is full of germs and bacteria. It is important to do everything you can to ensure that this is removed from your home so that it is safe for you and your family. Sunrise Chem-Dry has a ton of options to allow you to ensure that your home is clean, healthy and safe. 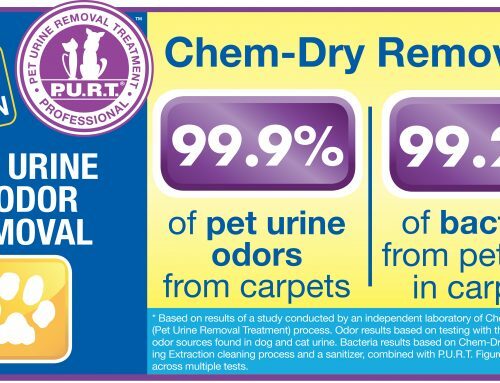 This is another reason this is the best carpet cleaning for pet urine! You have the ability to truly clean your home to make it completely safe for those you love. I had mentioned before that urine contains an immense amount of germs and bacteria. Sunrise Chem-Dry has a sanitizer that they can use on your carpets to ensure that these germs and bacteria are killed. Sanitizer has the ability to kill 99.99% of all germs and bacteria within your carpets. When sanitizer is used on urine, it kills the germs and bacteria that are left within your carpet fibers. This product is sprayed on your entire carpet in each room before the cleaning to ensure that it is cleaner, safer, and healthier for you and your family! As mentioned before, the P.U.R.T. takes about 24 hours to completely break down the urine and dissolve it entirely. During this 24 hour period, the smell will become worse before it gets better. It is advised to open a window during this time period and to keep air flowing. Luckily, Sunrise Chem-Dry offers a deodorizer that will keep the odor at bay. You can choose to have your carpets smell of fresh oranges or summer breeze! Unlike deodorizers in which you find at the store, this deodorizer will last for weeks on end! You will not even be able to notice the odor the urine leaves behind even during the solution process! 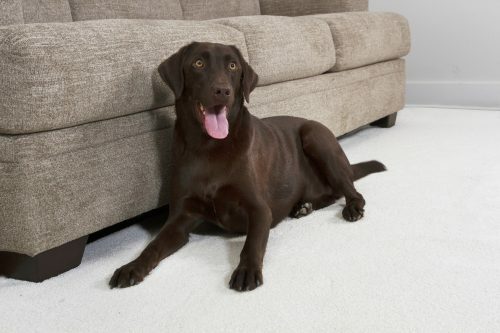 If your pets tend to have accidents on your carpets, then your carpeting has lost its protective barrier. Every carpet that is put into homes originally comes with a protective barrier on it. When acidic urine has contact with this protectant, it begins to eat away at it. This leave your carpet vulnerable for stains, traffic areas and more. If you want to ensure that your carpet stays cleaner for longer, this is the way to go. Protectant will not only protect your carpet from future urine stains but also accidental spills or high traffic. It will be much easier to clean up messes when protectant is used on your carpets. Pet urine will not have the ability to seep into the carpet fibers as deeply making the area damaged much smaller. Vacuuming will even be easier! Hair, fur, dust and debris will not be capable of setting into the carpet fibers as much making it easier to vacuum all of this up in a breeze! If your carpets have become victim to your pets, get the best carpet cleaning for pet urine today. Sunrise Chem-Dry will treat your home with the respect it deserves and ensure a deep clean that will rid your home of spots, stains, and urine odor. No need to replace your entire carpet due to your pet. Sunrise Chem-Dry has made a promise to help you keep your home clean, safe, and healthy. The natural products will ensure that your home is cleaned professionally while still being safe for all of those that inhabit it. Get back to cuddling with your pets and leave the pet urine to us! Call Sunrise Chem-Dry today to book your appointment! 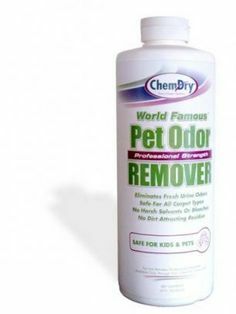 Excellent blog from +Sunrise Chem-Dry On Pet urine and pet odor treatment and removal. Thank you for the insight. Great info. I always look forward to your next blog post. Great article on Pet Urine in carpet. Thanks for the information. Thanks for sharing +Sunrise Chem-Dry! This is great information on the best way to handle pet urine on carpets. Great to know you guys can help with cat pee too! Six years are way too long to smell the cat pee!! Very informative post. Thank you for this information. I have yet to find anything that truly works on pet odors.